Recently, there was a small spat between the Core and Unlimited factions of the Bitcoin community, a spat which represents perhaps the fiftieth time the same theme was debated, but which is nonetheless interesting because of how it highlights a very subtle philosophical point about how blockchains work. 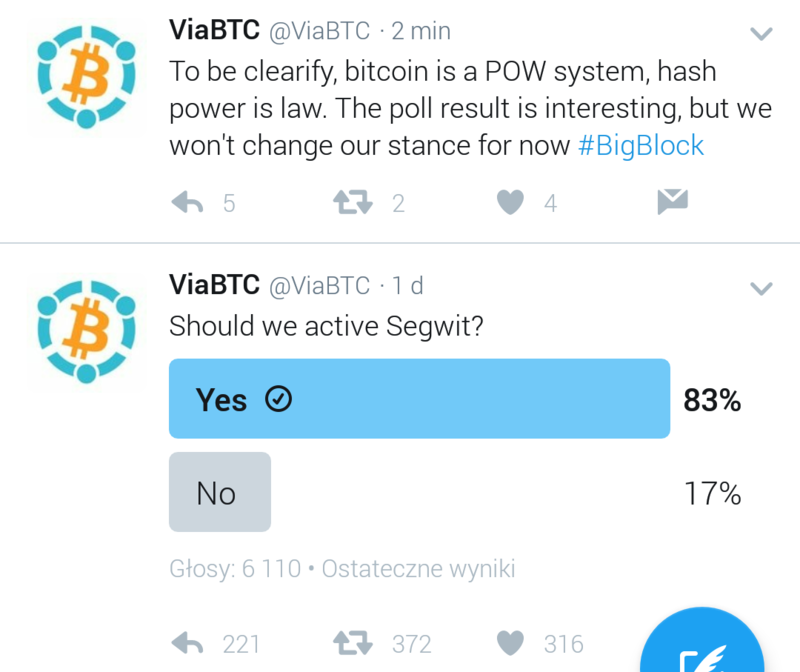 ViaBTC, a mining pool that favors Unlimited, tweeted “hashpower is law”, a usual talking point for the Unlimited side, which believes that miners have, and should have, a very large role in the governance of Bitcoin, the usual argument for this being that miners are the one category of users that has a large and illiquid financial incentive in Bitcoin’s success. Greg Maxwell (from the Core side) replied that “Bitcoin’s security works precisely because hash power is NOT law”. Many people often argue against the use of public blockchains for applications that involve real-world assets or anything with counterparty risk. The critiques are either total, saying that there is no point in implementing such use cases on public blockchains, or partial, saying that while there may be advantages to storing the data on a public chain, the business logic should be executed off chain. The argument usually used is that in such applications, points of trust exist already - there is someone who owns the physical assets that back the on-chain permissioned assets, and that someone could always choose to run away with the assets or be compelled to freeze them by a government or bank, and so managing the digital representations of these assets on a blockchain is like paying for a reinforced steel door for one’s house when the window is open. Instead, such systems should use private chains, or even traditional server-based solutions, perhaps adding bits and pieces of cryptography to improve auditability, and thereby save on the inefficiencies and costs of putting everything on a blockchain. The arguments above are both flawed in their pure forms, and they are flawed in a similar way. While it is theoretically possible for miners to switch 99% of their hashpower to a chain with new rules (to make an example where this is uncontroversially bad, suppose that they are increasing the block reward), and even spawn-camp the old chain to make it permanently useless, and it is also theoretically possible for a centralized manager of an asset-backed currency to cease honoring one digital token, make a new digital token with the same balances as the old token except with one particular account’s balance reduced to zero, and start honoring the new token, in practice those things are both quite hard to do. In the first case, users will have to realize that something is wrong with the existing chain, agree that they should go to the new chain that the miners are now mining on, and download the software that accepts the new rules. In the second case, all clients and applications that depend on the original digital token will break, users will need to update their clients to switch to the new digital token, and smart contracts with no capacity to look to the outside world and see that they need to update will break entirely. In the middle of all this, opponents of the switch can create a fear-uncertainty-and-doubt campaign to try to convince people that maybe they shouldn’t update their clients after all, or update their client to some third set of rules (eg. changing proof of work), and this makes implementing the switch even more difficult. Hence, we can say that in both cases, even though there theoretically are centralized or quasi-centralized parties that could force a transition from state A to state B, where state B is disagreeable to users but preferable to the centralized parties, doing so requires breaking through a hard coordination problem. Coordination problems are everywhere in society and are often a bad thing - while it would be better for most people if the English language got rid of its highly complex and irregular spelling system and made a phonetic one, or if the United States switched to metric, or if we could immediately drop all prices and wages by ten percent in the event of a recession, in practice this requires everyone to agree on the switch at the same time, and this is often very very hard. With blockchain applications, however, we are doing something different: we are using coordination problems to our advantage, using the friction that coordination problems create as a bulwark against malfeasance by centralized actors. We can build systems that have property X, and we can guarantee that they will preserve property X to a high degree because changing the rules from X to not-X would require a whole bunch of people to agree to update their software at the same time. Even if there is an actor that could force the change, doing so would be hard. This is the kind of security that you gain from client-side validation of blockchain consensus rules. Note that this kind of security relies on the decentralization of users specifically. Even if there is only one miner in the world, there is still a difference between a cryptocurrency mined by that miner and a PayPal-like centralized system. In the latter case, the operator can choose to arbitrarily change the rules, freeze people’s money, offer bad service, jack up their fees or do a whole host of other things, and the coordination problems are in the operator’s favor, as such systems have substantial network effects and so very many users would have to agree at the same time to switch to a better system. In the former case, client-side validation means that many attempts at mischief that the miner might want to engage in are by default rejected, and the coordination problem now works in the users’ favor. Note that the arguments above do NOT, by themselves, imply that it is a bad idea for miners to be the principal actors coordinating and deciding the block size (or in Ethereum’s case, the gas limit). It may well be the case that, in the specific case of the block size/gas limit, “government by coordinated miners with aligned incentives” is the optimal approach for deciding this one particular policy parameter, perhaps because the risk of miners abusing their power is lower than the risk that any specific chosen hard limit will prove wildly inappropriate for market conditions a decade after the limit is set. However, there is nothing unreasonable about saying that government-by-miners is the best way to decide one policy parameter, and at the same saying that for other parameters (eg. block reward) we want to rely on client-side validation to ensure that miners are constrained. This is the essence of engineering decentralized instutitions: it is about strategically using coordination problems to ensure that systems continue to satisfy certain desired properties. The arguments above also do not imply that it is always optimal to try to put everything onto a blockchain even for services that are trust-requiring. There generally are at least some gains to be made by running more business logic on a blockchain, but they are often much smaller than the losses to efficiency or privacy. And this ok; the blockchain is not the best tool for every task. What the arguments above do imply, though, is that if you are building a blockchain-based application that contains many centralized components out of necessity, then you can make substantial further gains in trust-minimization by giving users a way to access your application through a regular blockchain client (eg. in the case of Ethereum, this might be Mist, Parity, Metamask or Status), instead of getting them to use a web interface that you personally control. Theoretically, the benefits of user-side validation are optimized if literally every user runs an independent “ideal full node” - a node that accepts all blocks that follow the protocol rules that everyone agreed to when creating the system, and rejects all blocks that do not. In practice, however, this involves asking every user to process every transaction run by everyone in the network, which is clearly untenable, especially keeping in mind the rapid growth of smartphone users in the developing world. There are two ways out here. The first is that we can realize that while it is optimal from the point of view of the above arguments that everyone runs a full node, it is certainly not required. Arguably, any major blockchain running at full capacity will have already reached the point where it will not make sense for “the common people” to expend a fifth of their hard drive space to run a full node, and so the remaining users are hobbyists and businesses. As long as there is a fairly large number of them, and they come from diverse backgrounds, the coordination problem of getting these users to collude will still be very hard. Second, we can rely on strong light client technology. There are two levels of “light clients” that are generally possible in blockchain systems. The first, weaker, kind of light client simply convinces the user, with some degree of economic assurance, that they are on the chain that is supported by the majority of the network. This can be done much more cheaply than verifying the entire chain, as all clients need to do is in proof of work schemes verify nonces or in proof stake schemes verify signed certificates that state “either the root hash of the state is what I say it is, or you can publish this certificate into the main chain to delete a large amount of my money”. Once the light client verifies a root hash, they can use Merkle trees to verify any specific piece of data that they might want to verify. Look, it's a Merkle tree! The second level is a “nearly fully verifying” light client. This kind of client doesn’t just try to follow the chain that the majority follows; rather, it also tries to follow only chains that follow all the rules. This is done by a combination of strategies; the simplest to explain is that a light client can work together with specialized nodes (credit to Gavin Wood for coming up with the name “fishermen”) whose purpose is to look for blocks that are invalid and generate “fraud proofs”, short messages that essentially say “Look! This block has a flaw over here!”. Light clients can then verify that specific part of a block and check if it’s actually invalid. If a block is found to be invalid, it is discarded; if a light client does not hear any fraud proofs for a given block for a few minutes, then it assumes that the block is probably legitimate. There’s a bit more complexity involved in handling the case where the problem is not data that is bad, but rather data that is missing, but in general it is possible to get quite close to catching all possible ways that miners or validators can violate the rules of the protocol. Note that in order for a light client to be able to efficiently validate a set of application rules, those rules must be executed inside of consensus - that is, they must be either part of the protocol or part of a mechanism executing inside the protocol (like a smart contract). This is a key argument in favor of using the blockchain for both data storage and business logic execution, as opposed to just data storage. These light client techniques are imperfect, in that they do rely on assumptions about network connectivity and the number of other light clients and fishermen that are in the network. But it is actually not crucial for them to work 100% of the time for 100% of validators. Rather, all that we want is to create a situation where any attempt by a hostile cartel of miners/validators to push invalid blocks without user consent will cause a large amount of headaches for lots of people and ultimately require everyone to update their software if they want to continue to synchronize with the invalid chain. As long as this is satisfied, we have achieved the goal of security through coordination frictions.